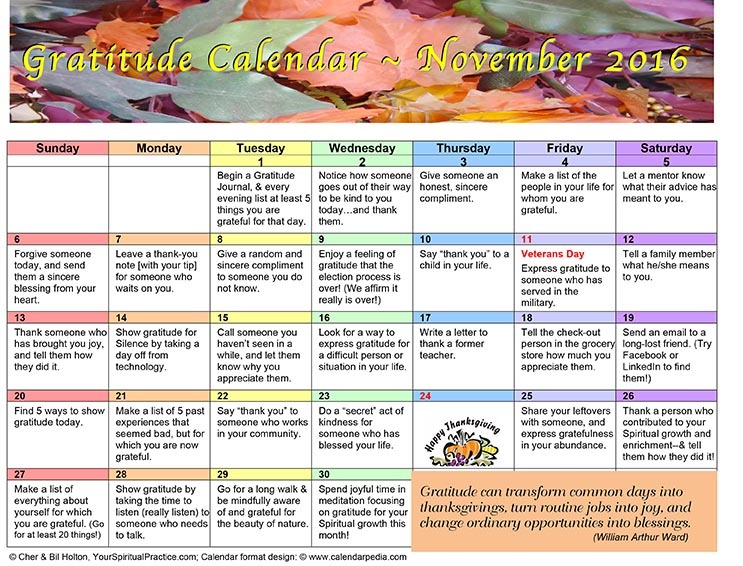 November is the month of Gratitude! In fact, we like to call this the month of Thanks-living! One of our favorite practices is to create a Gratitude Calendar for the month, with a simple act of gratitude listed for each day. We’d like to encourage you to download your free copy, and use it as one of your daily spiritual practices for the month. And we invite you to share your experiences in the comments section below! Tell us how an activity affected you, or what it led to for you. Or offer your own ideas for additional activities. We may even use one of your ideas (with credit) on next year’s calendar! Thank you for such a wonderful gift! You guys really help us make our spiritual path, a very practical one…Blessings!